Selecting the ideal private instructor is a very personal decision. Our directory provides our site visitors with an opportunity to evaluate as many private instructors as needed to make a fully informed selection. Our goal is to be the leading source for private instructors in the U.S.
Our online services will always be completely FREE for our users. Enjoy your Schedule Any Lesson experience. We only charge $8.99 per month to be a member. 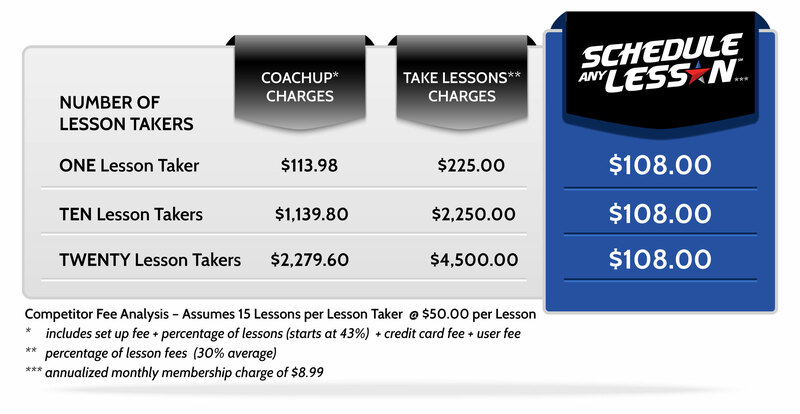 Our instructors receive all of our services for the cost of one or two lessons PER YEAR. We NEVER take a percentage of our instructors’ hard-earned money. Schedule Any Lesson provides a high quality platform for private instructors to represent their skills and services to lesson takers seeking help to achieve their goals and dreams. Private instruction offers everything from an opportunity to excel academically to gaining a competitive advantage in sports to having fun learning how to play a guitar or salsa dance. We offer 5 primary themes and 244 categories of instruction. Simply select an instructor and contact them directly to schedule your first lesson. We feel very strongly that our teachers and coaches are the backbone of America and that they are severely underpaid. Our singular goal at Schedule Any Lesson is to help these fine people make more money and keep the money they do make. You will never hear us disparage our competitors. What you will hear from us is a very clear differentiation between what our competitors charge their instructors and users versus what we do. Here is a concise contrasting of what we charge compared to the top two industry leaders. We are very proud of the value we provide our instructors and site users.